Next: Does Smoking Make You Thin? I identify with this card. I grew up being told that I would never get married or get a decent job if I didn’t lose weight, and that I would be a burden to my family because I wouldn’t be able to get health insurance. This is something I am struggling with right now. People do judge on physical appearance. It’s the cold, hard facts of life. Wow, this card couldn’t be any further from the truth for me! My boyfriend and I just got done discussing this 2 hours ago, and when I brought it up I said it almost word for word. Why do we worry ourselves into a depression about the way we look? I can’t watch tv or look through a magazine without hating it myself that much more because I don’t look like a model. It’s a horrible way to feel. I person who really felt the way described on that card would not express it the way it’s written on the card. This was written by someone who’s read articles on women’s body image issues, and perhaps taken college level courses in women’s studies. This so self-consciously mimics the patois of contemporary social science that it comes off as fake and disingenuous. I think a self reinforcing feedback loop has been created in the media over issues like this, and we’re about to reach the singularity. I can relate. Sometimes I feel like I’d give anything to be 10lbs lighter. When I step on the scale in the morning and notice that I’m 1 or 2lbs heavier, the rest of the day would be crap. As for what Mark has said. I agree. When you think about it, it’s hard to imagine someone who actually have body image issues writing something like that. 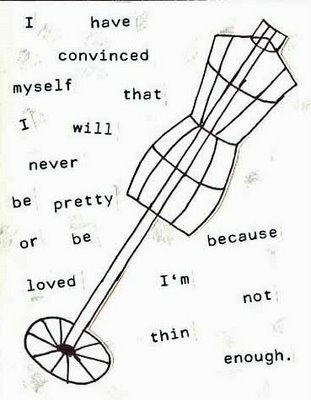 In saying “I have convinced myself…” they are already admitting that they are wrong in their belief that appearance is most important, and if that is what they really believe, they wouldn’t be grieving the fact that they’re not skinny enough, not pretty enough, etc.